Your fondest dream will materialize. But keep your excitement under control as too much happiness may cause some problems. Your creative talents will prove to be highly lucrative if put to proper use. Children help you complete household jobs. You may be overwhelmed by proposing as it unburdens you. Perfect time to put new ideas into test. Romantic songs, aromatic candles, good food, and some drinks; the day is all about this with your spouse. A good sleep is the best thing you can do for your health; you may do this today.lucky number: 3. The ability to bridge and connect enables you to make alliances, partnerships and agreements. A respect for tradition, heritage and duty helps you shape your actions and decisions, ensuring that the spiritual order is respected and not over thrown. It is time to for give, or to bring reconciliation to warring factions. The Hierophant symbolises a wish and capable advisor, forgiveness and comfort, the influence of established faith and the power of the conscious mind. 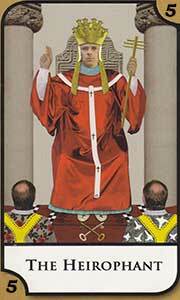 The Hierophant could represent a teacher and rules to get along, or an offer of advice.